Big or Small We Tow it All. Our large fleet of Tow Trucks, Lowboys, Landolls, Flatbeds and Speedcranes can handle anything and everything. We offer expert Emergency Tire and Road Service as well as On Site Mobile Mechanic and Diagnostic Services. Our Heavy Duty 50 Ton Rotator, Recovery Unit boasts a 50,000 lb. winching capacity, and 100,000 lb. boom capacity. Accurate Towing Service is open 24/7 to take care of all your towing needs. No job is too big or too small. Call us Today for a free estimate. We are the company the big dogs call when they need help. We haul everything from Military and Police Vehicles to Buses and Boats. We are experts in passenger vehicles and trucks of all sizes. 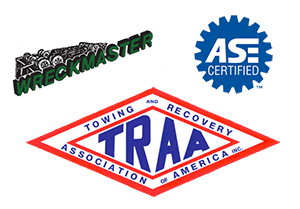 Looking for the best Towing Service in New Jersey ? Look no further, our team is comprised of top experts in Towing, Hauling, Repair and Recovery. Whether you need a car or a tanker truck towed or repaired our Nationally Trained and Certified Experts can handle all of your heavy hauling needs! We are equipped with Landolls, Lowboys, and Flatbed Trailers to provide you with the best priced long distance hauling services. Don’t deal with amateurs! You deserve the best towing service and you deserve having professionals inspecting and repairing your vehicles and equipment. Accurate Towing Service has been providing Towing Service in New Jersey since 1987. We have decades of experience in providing professional towing services for the New Jersey State Police and dozens of Municipal Police Departments throughout Ocean, Middlesex, andMonmouth County. For over 30 years, we have proven to be the best. We are stationed in Toms River and send our fleets out all over the central New Jersey area. Accurate Towing Service offers quick response times, quality repairs, courteous service technicians, and detailed incident management. We understand that every minute counts and we strive to provide reliable, superior service 24 hours a day, 7 days a week, to help you get back on the road as quickly as possible. Accurate Towing Service Towing Service. © 2019. Website by Creative Click Media.